With silicon near its development headroom, Intel has been putting its boffins to work on replacements, and one potential technology revealed in a Nature paper uses room-temperature quantum materials. Chipzilla claimed its magneto-electric spin-orbit (MESO) technology's important characteristics are low voltage (as much as five times below today's CMOS-based chips) and consequently lower power (between 10 and 30 times lower than CMOS). The technology is based on multiferroic materials invented in 2001 by UC Berkeley professor Ramamoorthy Ramesh. 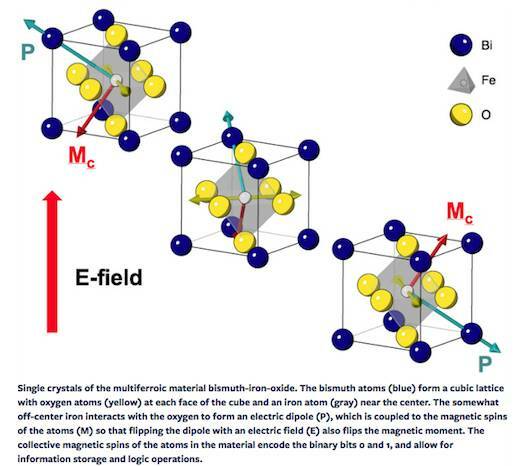 The university explained that MESO uses a multiferroic material that's both magnetic (like a common permanent magnet, the atoms are aligned) and ferromagnetic, and the two states are coupled: meaning if you change one, you change the other. To make this useful as a CMOS "replacement", researchers had to work to reduce the voltage needed to change the magnetic state, and that's where the Intel-led investigations came in. As noted in the paper at Nature, the MESO device "operates via spin–orbit transduction", which is "the coupling of an electron's angular momentum with its linear momentum". As well as low power, the team claimed five times better logic density than CMOS, and because the magnetic spin is non-volatile, it also offers an ultra-low standby power. The group also developed materials that use the quantum effect called spin-orbit coupling, in which current is determined by the direction of an electron's spin. That provided an efficient way to read out the state of the multiferroic. "In MESO devices, an electric field alters or flips the dipole electric field throughout the material, which alters or flips the electron spins that generate the magnetic field," the university said. The illustration below (with the university's original caption) explained the structure and operation of the material.